I'm intrigued by the hub bub over Tim Tebow. I'm facinated and shockingly ok with him and his churchiness. 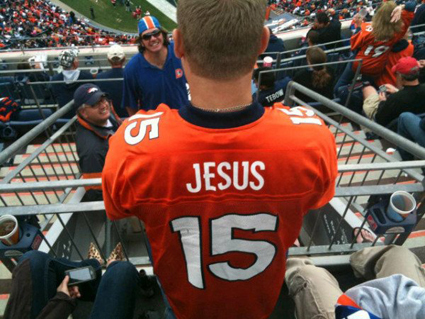 From the beginning, Tebow has made it clear that he is a religious guy. To be honest, as a general rule, I'm not a fan of churchy, preachy people. Especially churchy, preachy people at work. I'm not a fan of anyone inflicting their beliefs on others, but I respect that we all have our own opinions. However, what I can't respect is shoving those opinions on anyone else. I find it offensive when people intimidate and threaten others in the name of religion. 1965 cover of Esquire of NY Giants guard Darrel Dess. With that being said, we all know that one person that when someone sneezes and they say bless you...they mean it. My mom is like that. I tell her about a friend having a hard time and it turns into wonder twin powers activate and she hits the prayer chain. She doesn't mean any harm and isn't forcing it on anyone. She honestly believes she is doing something good. Tim Tebow is that guy. 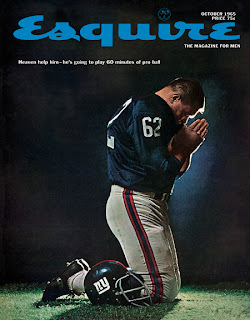 In the 60s, a player praying on the field was a gag, a joke. Now, praying in sports, in the NFL in particular, is something expected. 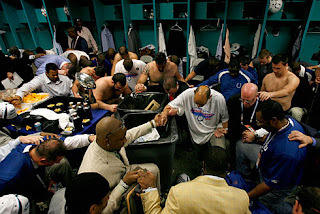 Guys praying in the locker room, before games, after games, in the end zone and on the sidelines. Guys from opposing teams are getting on one knee together after games to pray. 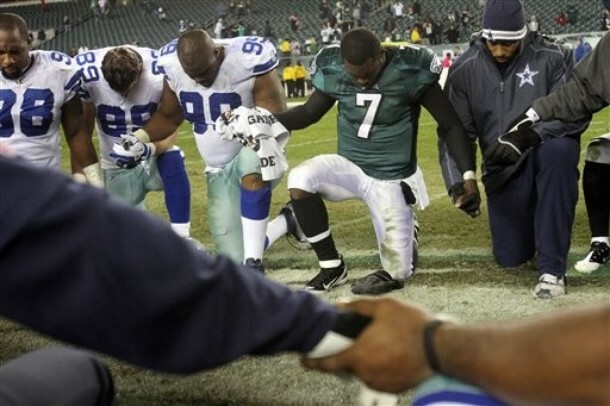 Michael Vick and the Cowboys pray after a game. Every couple of years, a story pops up about some guy feeling uncomfortable about religion in the locker room. Maybe he is Jewish and isn't comfortable with Christian prayers. Maybe he is agnostic. Maybe he just isn't into it. Whatever the reason, it shows that prayer is everywhere. I don't know. If I worked in a profession that every time I went to work, there was someone whose main goal was to knock my block off, maybe I would pray a little more. I don't think that there is anything wrong with being thankful for being OK and happy and successful. So if prayer is the way they go about it, who cares? Indianapolis Colts praying in the locker room...notice the SuperBowl trophy to the left. NFL players don't seem to care. Constantly pointing a finger upwards after scoring a touchdown or mentioning God in a press conference is par for the course. We expect rappers, athletes, or anyone else accepting a major award to thank God. This all leads to the question, why are people having a problem with Tebow? From what I can tell, he isn't forcing his religious beliefs on anyone. Why has "tebowing" gone viral? Are people mocking Tebow? For the most part, I think people are having fun with it. Tim Tebow has been the target of some pointed comments from opposing teams. The Baltimore Raven's Terrell Suggs said, “With all do respect, we don't pray on sidelines. 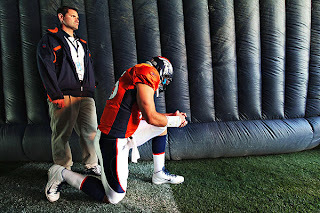 Once again God had to save Tim Tebow and the Denver Broncos..." The Detroit Lions received grief from the media when after in the second quarter of a game, Detroit linebacker Stephen Tulloch openly mocked Tebow's prayer pose after sacking him. 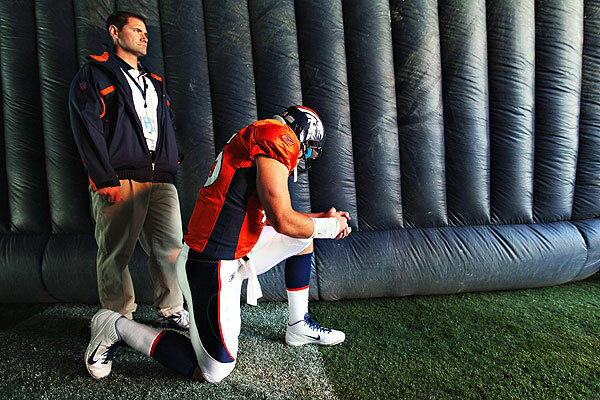 Later in the game, tight end Tony Scheffler mimicked Tebow's one-kneed prayer pose in the end zone. That is what I don't get. It is clear that teams pray. Religion is commonplace in the locker room. What is the problem Tebow? Is that problem that Tebow is too much? NPR recently did a story on how much is too much religion in sports, and I have to wonder if that is the root of the problem. Is Tebow just too much to handle? Are these guys pointing to God in the end zone only doing it as some perverse attempt at winning the Lord's favor for their misdeeds? Are they pointing skywards because it is the expected or hip thing to do? Because Tebow isn't. He is doing it because he believes. Trust me when I say that I am the last person to get preachy. But there is something weirdly refreshing about Tebow. The problem that people are having with Tim Tebow comes down to the fact that he is painfully genuine. When he is kneeling and praying, he is actually praying and not counting his money or saying the alphabet in his head backwards or singing the latest Lady Gaga song. He embraces his goody two shoes image because *that* is what he *is*. Tebow's faith has become a target because it is easy. Just because something is easy, it doesn't make it right. Tebow is being bullied by other players and he still stands by his convictions. With all the problems kids are facing today with bullying, I'm glad that he is still kneeling. The kid believes what he believes and no one is going to change that. 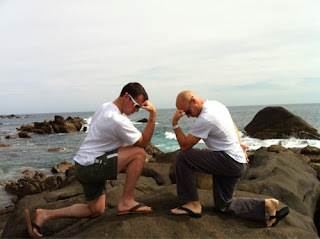 Kneel on Tebow. Kneel on.